I'm experiencing some serious nail envy these days. 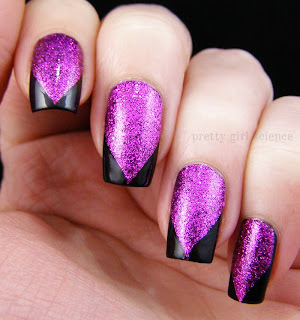 Amanda's stiletto nails are kinda superawesome. But I am way too chicken to change the shape of my nails. They like being squared. I'm afraid to anger them, lest they snap right off and abandon me. I decided to try and fake it a little, and I admit...I'm kinda in love with the look! All it took was some tape (and a fair amount of cursing) to fake it for the Halloweeny season. I feel very witchy! but I figured I'd let the internets decide. slightly less impressive when you look at it dead on. I'm considering it. But I'm trying to keep my nails a bit shorter these days...and stilettos only look badass on looong nails. Give stilettos a GOOOOOOOOOOO! You love them? Then have them! They sure do look goooood! I am definitely considering it. I just don't know if they will fit in with my day-job. I'd be afraid to poke one of the kids in the eye. The first picture is too cool!